From Fleet Street to the world of medicine, from the City of London to the corridors of power in Whitehall, Scots have exerted a determining influence on key areas of British life since the Union of the Parliaments in 1707. Now that Scots dominate Westminster and run their own parliament in Edinburgh, is the tartan takeover complete? 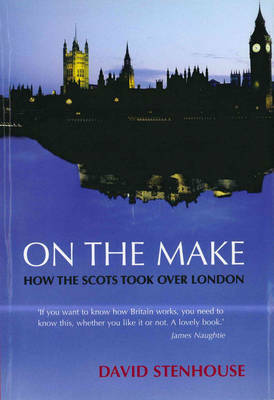 Through revealing interviews with some of the most successful Scots in London, including Kirsty Wark, Sheena Macdonald, Tam Dalyell, Norman Lamont and William Dalrymple, On the Make shows how citizens of the poorest part of the United Kingdom have gained unprecedented influence over British politics, the media and commerce. But success has not always led to popularity. While ambitious Celts have always encountered resentment from the English, Scots at home also often view their successful brothers and sisters down south as selfish careerists who have abandoned their country for the lure of English gold. With English commentators beginning to question the power of the Scots as never before, this hard-hitting book takes a challenging look at exactly how much power lies in Scottish hands in today's devolved United Kingdom.